The Four Corners region is a diverse landscape covering parts of Colorado, New Mexico, Arizona and Utah. With elevations ranging from 4,000 ft. to over 14,000 ft. the landscape character can change from alpine to desert within a few miles. The Four Corners climate is generally semi-arid. Precipitation averages may range from as little as 8 inches per year in the lower elevations to 15 inches or more in the local mountain ranges. Periods of limited rainfall and drought are beginning to pose a challenge for the expanding population of the region. The potential for catastrophic wildfires and insect epidemics compounds the problem. The average family of five uses approximately 217,234 gallons of potable water per year. Roughly 50% of this water is used outdoors to maintain lawns. As the regional population continues to grow, competition for limited water resources has elevated the need for conservation. Xeriscaping is a holistic approach to landscaping for the purpose of achieving water conservation and enhancing the relationship between humans and their built environment. Xeriscaping is a process that is founded upon seven fundamental horticultural principles. 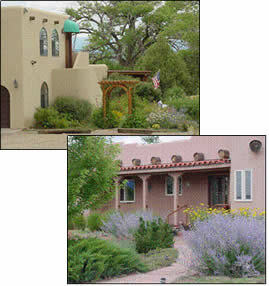 Often, xeriscaping is stereotyped as growing nothing more than cactus in a sea of gravel. In contrast, good xeric design practices result in a rich tapestry of colors, textures and plant materials that are adaptable to any style of landscaping. Good xeriscape design includes practical landscape considerations that affect the home, as well as the outdoor human– built environment.